European Pharmacopoeia, 6th ed., 2008 and Supplements 6.1 and 6.2 (Roxithromycin). A white or almost white, crystalline powder. It exhibits polymorphism. Very slightly soluble in water; freely soluble in alcohol, in acetone, and in dichloromethane; slightly soluble in dilute hydrochloric acid. Store in airtight containers. Gastrointestinal disturbances are the most frequent adverse effect, but are less frequent than with erythromycin. The dose of roxithromycin may need to be reduced in patients with hepatic or renal impairment. Acute interstitial nephritis has been reported in a patient given roxithromycin; renal function improved over several days after the drug was stopped. Acute eosinophilic pneumonia was attributed in a patient to the use of roxithromycin. The condition resolved after treatment with methylprednisolone. Acute pancreatitis, with duodenal inflammation, pain, pancreatic enlargement, and raised serumamylase developed in a patient within 24 hours of substituting roxithromycin for erythromycin ethyl succinate. Symptoms resolved rapidly once roxithromycin was stopped. For a report of an eosinophilic syndrome in a patient after treatment with azithromycin or roxithromycin, see Azithromycin. See also under Effects on the Lungs, above. For a discussion of drug interactions of macrolide anti-bacterials, see Erythromycin. Roxithromycin has a much lower affinity for cytochrome P450 isoenzymes than erythromycin and therefore has fewer interactions. It does not appear to interact with antacids, carbamazepine, oral contraceptives, prednisolone, or ranitidine. As for Erythromycin. It is reported to be as active or slightly less active than erythromycin. Roxithromycin is absorbed after oral doses with a bio-availability of about 50%. Peak plasma concentrations of about 6 to 8 micrograms/mL occur around 2 hours after a single dose of 150 mg. The mean peak plasma concentration at steady state after a dose of 150 mg twice daily is 9.3 micrograms/mL. Absorption is reduced when taken after a meal. It is widely distributed into tissues and body fluids; high concentrations are taken up into white blood cells. Small amounts of roxithromycin are distributed into breast milk. It is about 96% bound to plasma proteins (mainly aracid glycoprotein) at trough concentrations, but binding is saturable, and only about 87% is bound at usual peak concentrations. Small amounts of roxithromycin are metabolised in the liver, and the majority of a dose is excreted in the faeces as unchanged drug and metabolites; about 7 to 10% is excreted in urine, and up to 15% via the lungs. The elimination half-life is reported to range from about 8 to 13 hours, but may be more prolonged in patients with hepatic or renal impairment and in children. It has been reported that roxithromycin is not substantially removed by peritoneal dialysis. 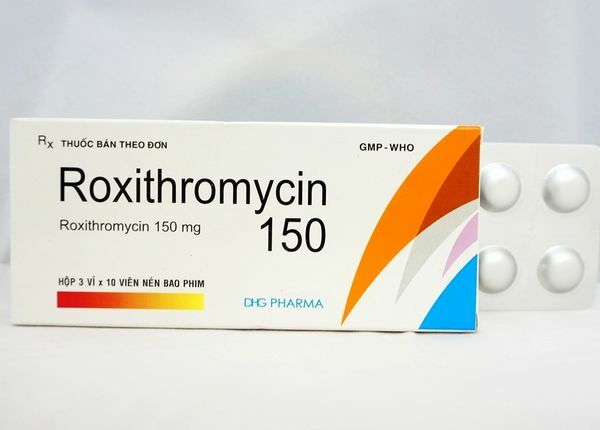 Roxithromycin is a macrolide antibacterial with actions and uses similar to those of erythromycin. It is given orally to adults in a usual dose of 150 mg twice daily or sometimes 300 mg once daily, at least 15 minutes before meals, for 5 to 10 days in the treatment of susceptible infections. Dosage may need to be modified in patients with hepatic or renal impairment (see below). For doses in infants and children, see below. In children weighing from 6 up to 40 kg a dose of 5 to 8 mg/kg daily of roxithromycin may be used. The licensed product information for roxithromycin notes that safety in hepatic impairment has not been established and advises halving the usual daily dose (see above) if used. The licensed product information for roxithromycin notes that safety in renal impairment has not been established and dosage adjustment details are not specified. A pharmacokinetic study in 20 subjects (10 with normal renal function and 10 with severely impaired function) suggested that doubling the dosage interval of roxithromycin would be suitable in those with a creatinine clearance of less than 15 mL/minute. Gingival hyperplasia is a well recognised adverse effect of ciclosporin treatment; a small study indicated that roxithromycin could reduce overgrowth, possibly by an effect on transforming growth factor-β. For the use of another macrolide, azithromycin, for this indication see Hyperplasia. For mention of studies investigating roxithromycin in the prevention of ischaemic heart disease, see under Azithromycin. Venezuela: Rancolid; Roxicure; Roxitrol; Rulid.